Omnichannel retailing has become a bloated buzzword. Here's how your brand can realistically leverage it for increasing revenue through personalization. TL;DR, Omnichannel retailing is commonly considered to reflect the true experience of today’s customers. However, while all agree this is what marketing should strive for, the fact of the matter is that no one fully understands it, making omnichannel a buzzword many vendors like to over-sell. 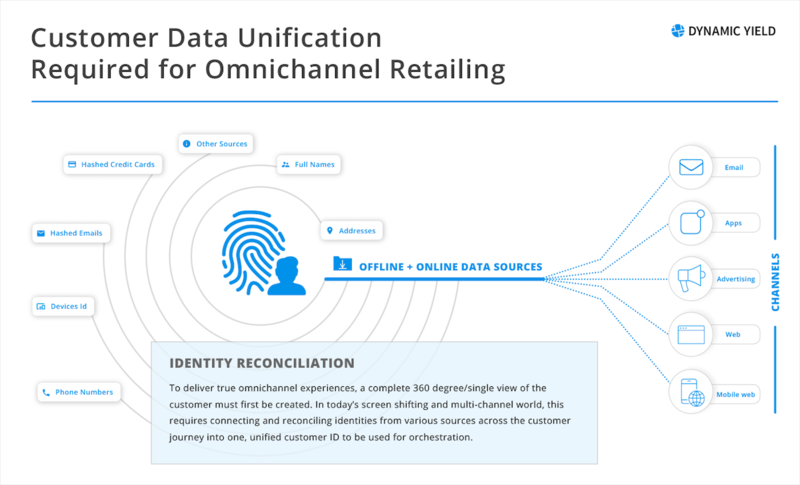 This article aims to investigate how omnichannel retailing has become an over-bloated buzzword in the industry, and how more realistically, your brand can leverage it for increasing revenue streams through personalization. Hailed as the be all end all of modern-day marketing, these days, going omnichannel is advised on every industry marketing blog and forum you visit. It’s discussed in webinars, talked about at conferences, and touted by some of the most credible firms and agencies in the field. In fact, a recent study by McKinsey Research and Harvard Business Review found omnichannel retail customers spent an average of 4% more on every shopping occasion in-store, and 10% more online than single-channel customers. Additionally, that the more channels a customer used, the more they would spend. Even better, according to IDC Retail Insights, there’s a 5-10% increase in loyal customers’ profitability, and 30% higher lifetime value than those who shop using only one channel. Discover why in an evolving technology landscape, data recquires flexbility and control on the part of the user, not the vendor. So while we all know and understand that providing a cohesive experience across device, channel, and location is of the utmost importance, is it actually attainable for those interested in capitalizing on the promise of such precise customer journey orchestration? The rest of this article aims to investigate why this is and how, with more realistic goals, your brand can map out and optimize for a set of different omnichannel paths to purchase. The interest is clearly there — people are searching for omnichannel related content at higher volumes by the minute. That might even be why you are here! And to be totally transparent, our motives aren’t completely far off from those, sans the part where we deliver some generic list of obvious statements for why omnichannel is so important to your business. No, instead, let’s get into the technical aspects and challenges of customer journey orchestration. Flawlessly framed, sure. Unrealistic, absolutely. In order to achieve even a fraction of the omnichannel scenario above, a company must be able to first create a complete 360 degree/single view of the customer. This requires connecting identities across channels, devices, and apps based on the activities of an individual customer, often with an unknown identity. Only the right technology can make deterministic and probabilistic matches in order to created one synced, stable identifier across devices. But many of the most comprehensive solution providers on the market simply cannot account for every online, off-site, direct mail, in-app, and in-store + interaction to catch users in the spider-like web being spun across their own unique customer journey. And even if it could, it would still have to confront issues of stale data, i.e. cookies expire, people fall in and out of customer segments, don’t update their account info, go through change of life events, as well as experience altered behaviors and attitudes. Much of which may happen outside the realm of interactions with your brand. Astonishing, I know… you can’t be there to capture every tiny moment in a customer’s life in order to predict with 100% certainty the next best action or personalized experience to deliver. If you did, you most certainly would not be in compliance with privacy rules and regulations. You might even have a class action lawsuit on your hands. Outside of identity resolution, the infrastructure and resources necessary to accommodate the scenario above would not only be absurd, but impossible to scale. Common sense for the win! Have I used the phrase customer journey in this post? But now that we’re on the subject, I wanted to float by the notion that framing interactions with customers along a “journey” without a solve for the identity issues above isn’t helpful. In fact, it may be detrimental. All a retailer can really do is determine the most popular paths to purchase and optimize them for its most valuable consumers. OMG, multi-channel is so 2013. Well, if multi-channel is now riding the plateau of productivity on Gartner’s five-step hype cycle, omnichannel is most definitely operating at the peak of inflated expectations. We may have set our sights on a more promising approach *cough* buzzword *cough* but if it doesn’t deliver on its own expectations shouldn’t we refocus on what can currently be accomplished with great accuracy? The paths to purchase outlined above reflect only a few potential touchpoints to consider when mapping out the best possible experiences for new and returning customers. For example, how do you connect in-store to the online experience? Additionally, emerging technology such as voice assistants make it possible for people to interact with brands right their Google Home or Alexa device, and soon enough, make purchases. Will this influence your marketing strategy? Every business will have it’s own unique users to cater to with varying preferences, habits, and attributes. Try to remember there’s never a silver bullet or one-size-fits-all approach — dig into your data and build a custom program fit for your users. Omnichannel retailing is the practice by which a variety of channels are integrated and leveraged to influence a customer’s purchase decision. Multi channel retailing refers to all of the available outlets or touchpoints a specific retailer can leverage in order to better influence the customer decision making process. Multi-touch marketing is an approach at the campaign level to reach target audiences with a consistent message, reinforced through distribution across a variety of channels at one time. Consider this section your inspo board on Pinterest for potential “omnichannel” recipes, frameworks, or ideas that can be adapted for your use. Sephora has long been a pioneer in personalization and omnichannel retailing, creating its robust omnichannel loyalty program, Beauty Insider in 2007 back when most retailers thought the future was QR codes. In the decade since, Sephora has been a paragon of omnichannel innovation, introducing Color IQ, Sephora Play! and a 3D augmented reality app to let shoppers “try on” makeup at home before entering the store. The queen of cosmetics continues to set the standard for omnichannel, doubling down this month by promoting longtime exec Bridget Dolan (of Sephora Innovation Lab fame) to SVP Omnichannel Experiences and Innovation and Mary Beth Laughton to EVP of Omnichannel Retail. Hands down, the most ambitious omnichannel initiative of the year goes to West Elm for creating an AI tool that can scan my Pinterest board and learn my aesthetic in seconds to recommend the perfect couch. Led by VP of Innovation Luke Chatelain in partnership with Clarifai, the Pinterest Style Finder overcomes many of the traditional pitfalls in omnichannel retailing, notably that it can recommend products based on your current tastes without relying solely on browsing and buying history. No industry is a better example of the importance of crafting a great omnichannel experience than mattresses. With every brand in the market selling a near identical squishy rectangle, the only way to stand out is by delighting your customers across platforms. After proving to the world that you don’t have to try a mattress before you buy it, Casper realized it could outflank its newfound online mattress competitors precisely by letting people try its mattresses. Casper partnered with West Elm and introduced its own pop-ups to let folks lay on its flagship product before ordering on their laptop or mobile phone. While shipping a mattress in a box allowed it to become a $100 million company in two years, it is Casper’s strength in omnichannel that allows it to remain the supreme power in the mattress wars. Walking into Sabon’s store in Williamsburg is truly a transformative experience. For just a few minutes, one can escape the invasion of yuppie children by getting lost in soothing soaps and oils. Sabon also does a brilliant job extending this experience online, personalizing the entire homepage based on a visitor’s interests and ingesting CRM data to help create engaging online experiences based on past purchases. A paradise for all things home renovation, Home Depot has long stood as one of the biggest and most well-renowned superstores of its kind among contractors and consumers. But a rapidly evolving eCommerce landscape and the ubiquity of mobile meant Home Depot had to shift from sheer square footage to a more friendly customer experience. As a result, a comprehensive omnichannel strategy connects customers, contractors or DIYers, to information and advice before and after a purchase. Whether made online for in-store pickup or selected in-store for purchase online, sales associates armed with the digital technology to assist in decision making are transforming overwhelming home improvement projects into streamlined experiences with Home Depot at the heart of orchestration. While approaching the customer experience through the lens of a “journey” may make us feel more customer-centric, it really functions more as an analogy than it does a practical model for interaction. Life, liberty, and the pursuit of material items simply does not happen in a bubble. Combined with technological limitations, these complexities are far too severe for the creation of 100% seamless experiences, even for the most advanced companies. Used loosely and applied strategically, though, frequently taken paths and interactions can be used to plot omnichannel journeys that actually resonate. Vendors can and should be employed to optimize the customer experience across the various touchpoints made available from a brand. As mentioned earlier, though, it must reconcile user identification keys from places like desktop, mobile, offline, and in-store. Which channels does your solution encompass? What is your strategy for mobile? Will your platform provide a unified view of my customers? How do you illuminate and enhance the customer journey? Remember, a 360-degree view of the customer doesn’t die with the promise of absolute omnichannel — it remains the foundation of personalization, no matter what the device, campaign, channel, touchpoints, or path.